We're going to try something new this time: we're going to preview some Brundali Rail Heist cards early! As we've mentioned, Bai Watu and Jembravonti are the two countries on this industrious island. There's plenty of people and stories to tell, and Brundali Rail Heist focuses on a select few factions. A whole new world with a whole new set of characters means... a whole new set of skills! Brundali Rail Heist features all sorts of characters, including shady thieves, haughty fashionistas, energetic dancers, and more! Let's see what's new in Heist! A Renegade provides support to a team as a whole. They're ready to join any team and get to the front of the line, as long as there's fun to be had. As a Renegade, Yang gets a +3 PE bonus to all of his PEs when he's the only swinging Furre. Notice how Yang's PEs are 2 / 2 / 2 / 2. When he swings alone, his Renegade bonus increases his PEs to 5 / 5 / 5 / 5 for this turn. Renegade is a triggered skill. There's no cost to use it. Simply make it trigger by swinging with the Renegade! There's no bonus when a Renegade puts out. Renegade is a strictly offense-based skill. Lots of people have a kink or two -- and your harem works better when you satisfy their kinks! When a card has a Kink, each instance of its Kink means you can play it for 1 AP less! For example, Maid Otosa costs 8 AP and 1 Female Point, but she has a kink for Furres -- specifically Furres your opponents control! So if you opponent has three Furres in the scene, that reduces Maid Otosa's AP cost by 3, from 8 AP to 5 AP, so you only spend 5 AP and 1 Female Point to play her! A Kink only reduces a card's AP cost. It never reduces a card's GP costs. A Feisty character is ready to jump head-first into excitement and worry about consequences later. They get things done more efficiently when they're in the middle of the action! A Feisty Furre gives you an extra 1 AP at the beginning of your turn... if it's exhausted! But wait, aren't Furres useless when they're exhausted? Not anymore! A Furre is either refreshed (facing you) or exhausted (turned to its side). A Furre starts out refreshed, then becomes exhausted by swinging or by using certain skills. Feisty is a triggered skill, just like Renegade. There's no cost to use it. Simply wait for it to trigger during your refill step! After the refill step is the refresh step, where you can spend 1 AP to refresh everything you control. If you refresh any Feisty Furres this way, you don't lose the extra AP that you gained in the refill step. Remember that the refresh step is all or nothing! You can either refresh everything you control or nothing you control. A Meddler is a tricky character. Either by sabotage, seduction, or distraction, a Meddler delays another character from doing what they want to do. To make a Meddler meddle, choose a Furre to meddle, spend 1 AP, and exhaust the Meddler. The meddled Furre now costs an extra 2 AP to put out (defend). Meddling is an activated skill, so you can activate it at any time during any player's main step! However, like all Furres, it can't be exhausted until your next turn, so you'll have to wait a turn before meddling! A Furre can be meddled multiple times (by multiple meddlers) to increase its cost to put out! You have to meddle BEFORE your opponent chooses which Furres put out. Conversely, your opponent should ask if you want to meddle anyone BEFORE choosing which Furres put out. Your opponent doesn't need to put out with a meddled Furre! But you can use Meddlers to your advantage to decide who will enter bed against your swinging Furres! And that's all for now! I hope this gives you some insight into what's going on behind the scenes in Brundali Rail Heist! The heist begins this summer! Brundali Rail Heist preorders start June 1st! Oh, these are going to be some fun new mechanics. I can already see some good uses for meddler, depending on what cards are set up with it. I can see how generally all of these are good concepts to build decks around. Very fun I think! Kink has a lot of potential, but I kind of have to wonder if most of the Kink skills relate to things on your own side of the field, enabling synergies with cards that have the right properties, or to things on your opponent's side, making them good for countering a particular strategy. A deck made around the kink and feisty skills may be a fun idea to try. Nezumi, as far as I am aware, the only limiting factor is the cards themselves. I do not believe there is any rule that currently caps AP generated per turn. Same for GP. Seppel and his dev team balance things pretty well that when it concerns AP, you have factors that limit it naturally like 3 of a card etc. So, between 40 cards in a deck, 3 of each unless it's a home haven, it works out pretty well. The most I've managed in my decks is 19 ap. I'd be hard pressed to imagine a tourney competitive deck that could manage higher than say, 25. And even then I don't think that's possible in a competition deck that can win games. love the new abilities. i may have to grab a bunch of those Feisty Herms for a deck. is there a max limit on how much AP you can get at once? i didn't see one in the comprehensive rules, but between havens, furres (especially with Feisty soon to be available), and other cards it wouldn't be impossible to rack up nearly 50 AP in a single round. Awesome new skills, can't wait to see more. Though...137 makes for a smaller set than recent trends. I am looking forward to working these new skills into my decks. Also like the card art. June can not get here fast enough. Wow, didn't expect to skill full card spoilers so soon. 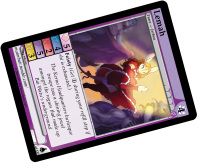 I have to say though, I love Lemah's card and hir artwork. Very cute. Page loaded in 0.0519 seconds.